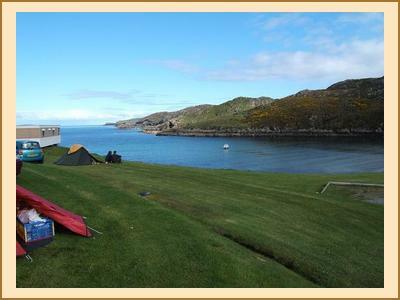 We arrived at Scourie campsite on Friday night to find far fewer people than expected - many had been put off by the very poor weather forecast. Fortunately everyone's timing was spot on 'cause there was just time for me to pitch my tent before we headed off to the hotel for a wee drink. Although there was only a few of us there was much hilarity with Bill B regaling us with tales of the gravel pit he had slept in on Thursday night and Owen extolling the virtues of the TV prog Pingu. Saturday morning was windy and dry but didn't look promising. Alison W and friends turned up briefly on their way home from Orkney but declined to stay 'cause the weather looked so awful. The numbers then depleted rapidly as Owen, Dennis and Jenny (who had all been up for the week) headed home leaving only myself, Bill B and Gillian. The three of us drove round to Ben Hee and contemplated for a while. The weather was truly awful with strong winds and heavy rain so Bill suggested we returned to the coast where the weather might be better. No such luck - we ate our lunch in the car at Oldshoremor whilst the car rocked from side to side in the wind and the rain lashed against the windows. We decided to abandon for the day and drove back to the campsite - by this time it had dried up so I drove Bill and Gillian round to Tarbet to do the walk back over the hill to Scourie. I returned to the campsite to sort my tent - I'd pitched it beautifully but left the ground sheet sticking out and so what seemed like gallons of water had funnelled under and into the tent. In the evening, Anne C arrived just in time to join us at a local seafood restaurant (Shorehouse in Tarbet) where we had a first class meal followed by a nightcap at the hotel. Sunday looked a bit better and so Bill, Gillian and Anne headed North to Carnstackie and Beinn Spionnaidh. They had a good day with only a few snow showers and some views. I opted for a very nice low level walk along Loch Glendhu. After a few drinks sitting out at the campsite we all wandered along to the hotel for an excellent bar meal. Monday dawned brighter so Anne, Bill & I went to climb Ben Hee (and Beinn Direach and Carn an Tionail) whilst Gillian did Beinn Leoid. It was a cold day but with good views and turned warm and sunny in the late afternoon. It was such a beautiful evening at the campsite that only one of Bill's hareem would accompany him to the hotel for dinner. We sat outside after dinner until the sun set before returning to the hotel for a nightcap. We awoke to blue skies and sunshine on Tuesday (and still no midges!). Bill had to return to Edinburgh and was going to do Ben Loyal on the way. 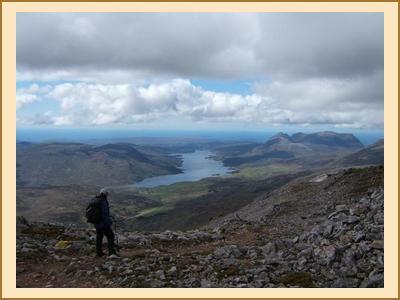 Gillian did Arkle whilst Anne & I did Ben More Assynt and Conival. It was an excellent day - warmish, sunny and only a few light showers. After dinner at the campsite we sat in the sun until late eating cheese and chatting before heading to the hotel to warm up again. Of course, we could have sat out longer if we had more effective wind break. Gillian had brought a windbreak but for reasons best known to herself she had removed the poles, cut it in half and was using it to sit on! Wednesday was grim - Anne headed South whilst Gillian and I drove up to Durness. It was so wet that full waterproofs were needed to get out of the car. Thursday didn't look much better so I abandoned leaving only Gillian who packed her tent away and then decided she was going to stay another night after all. Anyway, the four of us had an excellent meet. Good food, good company, lovely campsite, beautiful views and not a midge in sight (they must have got hypothermia! ).